Getting the long-stay visa approved was actually not overly difficult, it just involved a lot of work. If this is something you’re seriously considering doing, my first recommendation is do not try this on your own. At least the first time. As I already mentioned, customs and practices here are likely very different than those in your home country and it is money well spent to have someone on your side who has done this before. We got in touch with Jacob Young at Visa Solutions before we even left the United States and he has been working with us through the whole process. His involvement made this whole thing infinitely easier. What exactly is a long-stay visa? Many people don’t need to do anything special to simply visit the Czech Republic; Assuming you are an American—or Australian or Canadian, for that matter—you can simply book a flight and bring your valid passport and spent up to 90 days in the Czech Republic (and, by extension, Europe in general) without getting pre-approval for any type of visa. If you’re staying longer than 90 days, however, you need to apply for a long-stay visa. The initial long-stay visa can be valid for up to an additional 180 days (six months) and after that can be extended again in two-year increments. As you can expect, there was a lot of paperwork that had to be gathered: January and I each needed to provide a letter from our US bank confirming our available balance to prove that we had the funds necessary to support ourselves. We also needed certified copies of our marriage license and Lucy’s birth certificate. We then needed two separate signed forms from our landlord here in Prague that we had in fact obtained accommodations and also that I was permitted to operate my business out of them. Building on that, we had to provide paperwork showing that our landlord did, in fact, own at least 51% of the property we were staying in. We had to include a copy of the actual lease, photo copies of all of our passports, and finally an affidavit for a criminal history background check. Finally, because the type of long-stay visa we were applying for was based on me being here for the purposes of conducting business, I had to apply for a local trade license (locally known as the Živnostensky license) and include the preliminary approval; This step actually appears to be something of a catch 22, as you can’t get a business license without having an approved visa, and you need to show that you’ve been approved to work here before they will give you the visa. For that reason the Živno application process is broken into two pieces, where you are given something of a pre-approval that you need to submit with your visa application, and then when your visa is approved you have to return to their offices to get your final, approved license. Beyond simply getting the paperwork together, anything that was not in Czech had to be translated by someone officially licensed to do that sort of translation; We had to send our bank documents, marriage certificate and Lucy’s birth certificate to a company that specialises in this, after which it had to be notarized and stamped by a local translator. 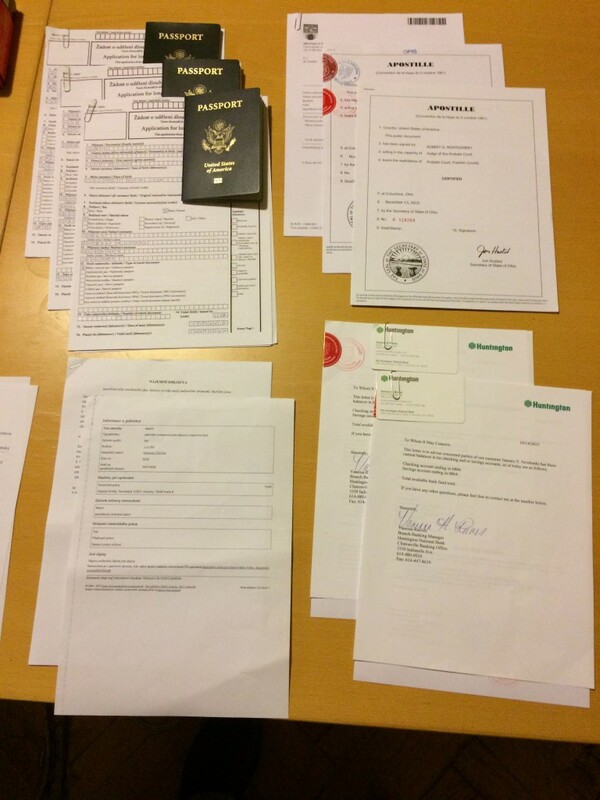 Finally, once all of this paperwork was in order, we had to make an appointment with a Czech embassy that is not inside the Czech Republic for an application meeting. 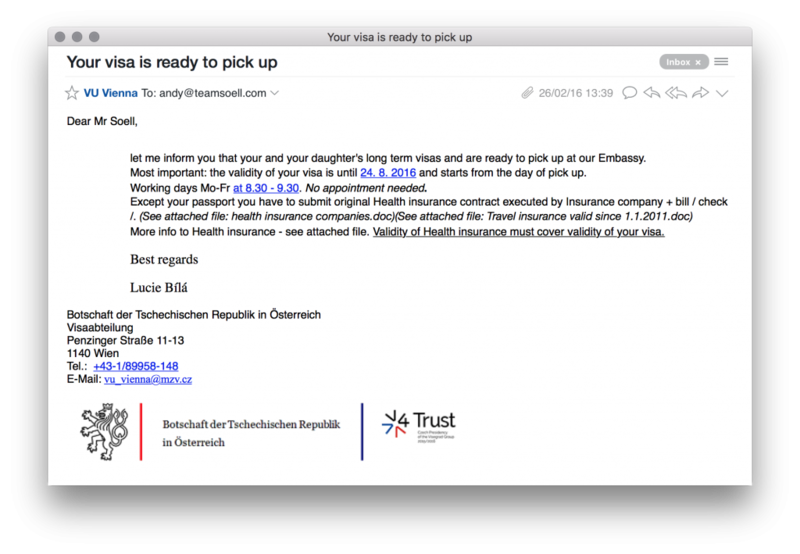 After helping us organize all of this documentation, get the translations, get the stamps, and fill out the applications, Jacob called the Czech embassy in Vienna and got us an appointment for December 14. We had never been to Vienna, so we thought we’d make a trip out of it. We had a really nice time seeing all of the Christmas decorations, visiting the palace at Schloß SchönbrunnSchloss Schonbrunn, and seeing all of the animals (and dinosaurs!) at the Naturhistorisches MuseumNatural History Museum. If you’re ever near Vienna during the holidays, you definitely need to visit the Christmas markets. A lot of really cute ornaments, clothes items, and crafts for sale at little booths all around the city—along with some of the strongest punch I’ve had in my life served out of commemorative little shoe cups. WOAH do these guys know how to make a strong Christmas punch. At the end of our trip we gathered up our paperwork and passports and headed over to the Czech embassy for our appointment. The story leading up to this appointment involves more mishaps than an episode of The Amazing Race, so I’ll leave those details for another time, but the short version is that we arrived in time, submitted our paperwork and a small processing fee of around 100€ and had a 15 minutes conversation about our plans. Then, the waiting. The wait was probably the most difficult part. They never tell you exactly how long the process will take, only that it usually takes somewhere from 30 to 60 days. During this time, you will search the Internet and ask friends for their visa stories. The ones that people like to tell are the horror stories, the ones where someone waited for 11 months, or the ones who never heard back, or the ones whose applications were rejected because a document wasn’t stamped quite the right way. Add to this the pressure of knowing that technically you aren’t supposed to be in the country past the 90-day tourist visa window, even if you do have a long-stay visa application in process, and we were getting a little nervous. So when our application took the better part of three months, we were prepared for the worst. Then, on February 26, we got the most wonderful email we’ve ever received. One of the requirements of obtaining a visa in the Czech Republic is that you pre-pay for a certain level of health insurance for the duration of your approved stay. Now that our approval came through it was time to get signed up, and the process was surprisingly easy and affordable; We were able to get comprehensive coverage for the family, prepaid for six months, for about $700USD. Our return trip to pick up our visas wouldn’t turn out to be as much of a vacation as the first trip. The news of our approval came right at the beginning of Czech spring break and while we spent the better part of a week trying to find a boarding facility or a dog sitter for our best four-legged friend we finally had to deal with the fact that it just wasn’t going to happen. Faced with the decision between waiting another week (or two) to pick up our visas or just sending one of us to pick them up we begrudgingly opted for the latter. So, after a quick trip to the notary to get a power of attorney for January, I packed up our passports and boarded an overnight bus to Vienna. The night bus is actually pretty nice. Their built-in entertainment systems gave me the opportunity to get caught up on the Transformers movie franchise (three hours I will never get back) and get a little sleep before we rolled into Vienna at 4:30 in the morning. The Czech embassy gave us a one hour window beginning at 8:30 when we could pick up the visas, so I spent the next few hours at a local all-night restaurant drinking excellent coffee and passable breakfast sandwiches. 7am rolled around and I made my way to the embassy, got our visa page added to our passports, and then was on the road again by 10:45am. Probably one of the shortest road trips I’ve ever been on. I was going to wait until everything was officially official before writing this post, in an effort to be as comprehensive as possible. If there’s one thing I’ve learned through this, though, it’s that governmental paperwork and procedure involved in moving to a new country is rarely ever “final.” After arriving back in the Czech Republic with our approved visas, the work continued. We already made our visit to the offices of the foreign police, a step that is mandatory within three days of your return from picking up the visas, and now I need to pick up my final, approved business license. After that we go through the process of learning how to pay local taxes, contribute to Czech social security, and basically get ourselves in a good position for our visa renewal. The current one is only good through late August, so we will need to re-apply for an extension on our visas around the middle of the summer. All that to say, we’re officially approved to continue our time in Prague at least through the coming warm months, which is something we’ve all been looking forward to. With the good news we’ve finally given family members the “all clear” to make their travel arrangements to visit us in the Spring, so we’re looking forward to seeing some familiar faces and taking them around to visit our new home. Getting here was a lot of work, but I can say that it’s been worth the effort.